This learning event took place on on Tuesday 14th June 2016 at The Anna Freud National Centre for Children and Families in London. It focused on co-creation of services with children and young people and on shared decision making between clinicians and young people. YoungMinds held a workshop, Transformation and Participation. There were discussions about the different ways in which attendees had used participatory approaches within their organisations. The main theme that emerged was the importance and challenge of moving from a single user participation event to making participation business as usual and an integrated part of the system. Many areas have co-produced resources, information, environment and recruitment but would like to take it further with more integrated, system-wide participation. Shared decision making is core to the THRIVE framework but it can be challenging to implement in a system as complex as CAMHS and the wider system of services that support the wellbeing of children and young people. Professor Peter Fonagy described the role of shared decision making in giving children and young people agency in their recovery. Shared decision making is especially important when you consider findings that the relationship children and families have with their clinicians is just as important as the type of care being offered. i-THRIVE invited colleagues from the Dartmouth Institute in the US to talk about their model of shared decision making and the tools they have developed. 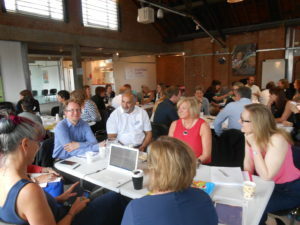 They provided much food for thought for how the ideas can be used to improve outcomes for children and young people.